NBC news presenter Brian Williams proved a more-than-steady anchor for the station Tuesday night when he calmly continued his live broadcast through a fire alarm. Brian Williams barely batted an eyelid when a siren went off in the channel’s 30 Rock studio in New York moments into the Nightly News show. The newsreader had just started a report about American Airlines filing for bankruptcy when he was interrupted by a drone followed by an automated voice announcement. But Brian Williams maintained his composure, only once or twice flicking his eyes upwards, as he carried on with the segment. At one point, as the noise continued, Brian Williams offered an easy chuckle and reassured viewers he was in no danger before reading on. Very quickly, viewers began reacting on Twitter, asking why someone couldn’t turn off the alarm quicker, while others praised Brian Williams’ cool-headedness. Brian Williams eventually handed over to his colleague Tom Costello in the channel’s Washington office in the hope the now-high-pitched siren would be fixed in the meantime. But the alarm buzzed on, through the Herman Cain story and through the lead-in to a story about the siege at the British Embassy in Iran. 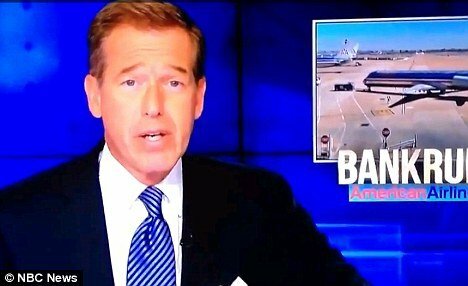 Brian Williams took a commercial break, but when he came back so did the alarm. Each time, Brian Williams kept his cool, reminding viewers everything was fine, even as his voice was again overwhelmed by the sound as he introduced a piece on Mexican drug wars. Finally, three-quarters of the way through the program, the alarm fell silent. As for the cause, NBC’s PR spokeswoman Erika Masonhall tweeted an explanation: “This is the first fire alarm in our new NBC Nightly News studio.